When Is The Right Time To Invest In Automation? Sales are booming, but your team is maxed and can barely keep up. People say it’s a great problem to have! Sure, but the truth is that it’s still a problem. Do you hire additional team members? Move into a larger facility? Perhaps you’ve explored robotic automation, but can’t imagine what that would actually look like. You’re facing a fork in the road, and the decision to scale your business will also transform it. So before you sign on the dotted line to automate, we’ve outlined a few questions for you to consider. What makes a good candidate for robotic automation? Does your business have two or more people doing a repetitive or cyclical task? Is that task structured with specific constraints and recurring outcomes? If the answer is yes, then automation will likely benefit you’re operation! 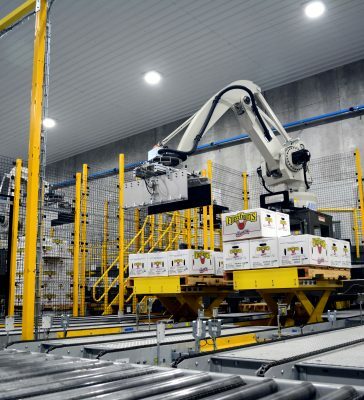 Identifying the exact robotic solution will require research and testing; but once deployed it’s typical to yield a full ROI within three years or less. Every business is different, but choosing the right processes to automate will initiate some quick wins and set you up for continuing success! Will this investment require downtime? Or what about training? The growing pains of rapid scaling often feel like changing the tire on a moving train. But don’t worry; implementing robotic automation can be fast and seamless, realizing cost savings as quickly as possible. As you manage the rollout timeline, be sure to prioritize training. Depending on the scope of the robot, team members will need to learn safety and operating procedures, programming, troubleshooting, and time to practice and get comfortable with the new technology. Is it possible to integrate existing technology with new ones? Integration will unquestionably drive productivity within your business. At Columbia/Okura, this is our specialty. Depending on the challenge, our team will partner with your existing vendors in order to optimize your current system and integrate supporting technology. Our technicians are available for on-site consultations to identify your unique needs and design innovative solutions.